music, speakers, and children’s games. 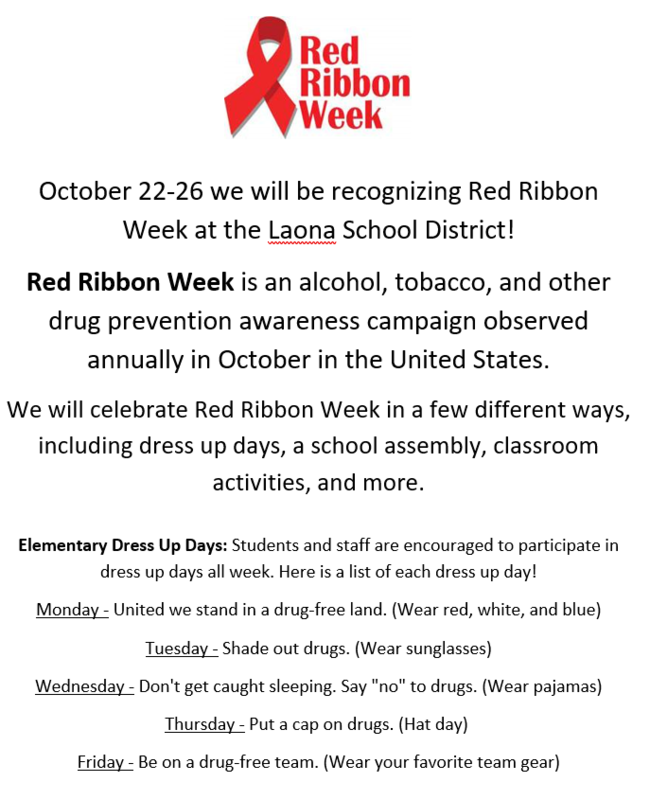 National Prevention Week is brought to us by The Substance Abuse and Mental Health Services Administration (SAMHSA), who sponsors a national campaign that takes place annually. This year’s theme is “Inspiring Action Changing Lives”. 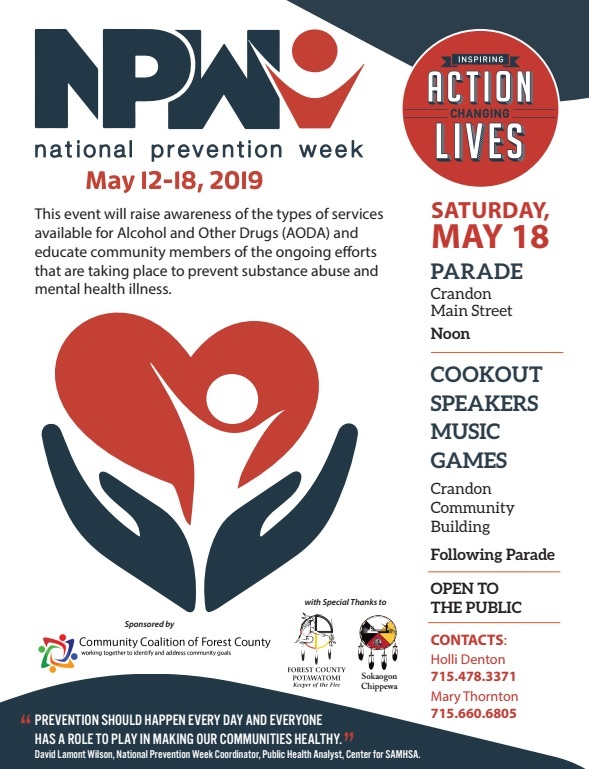 This event will raise awareness of the types of services available for Alcohol and Other Drugs (AODA) and educate community members of the ongoing efforts that are taking place to prevent substance abuse and mental health illness. This a community wide endeavor, involving all three school districts. The schools are invited to participate in the parade, along with their pep bands. Also in attendance will be representatives of both the Potawatomi and Sokaogon Chippewa tribes. We are encouraging business owners, to participate not only to show support for a substance-free lifestyle but also to advertise their businesses as promotors of a better Forest County. A healthy community is very attractive to area visitors and encourages our youth to stay in the area or return here after they graduate from college. Recently members of the Community Coalition of Forest County discussed ways to approach the underlying issues related to addiction in our county. The mental health well-being of our youth is one of our greatest concerns and recent actions by various organizations in the county prove that we all are willing to invest time and energy into improving the health and well-being of our residents. However, sometimes it is not easy to know when and how to help a youth experiencing a mental health or substance abuse problem. That’s why the Community Coalition is sponsoring a one-day free evidence-based training titled “Youth Mental Health First Aid” for school personnel, faith leaders, coaches, and other caring community members who have regular contact with young people ages 12-18. Youth Mental Health First Aid participants will gain knowledge of common mental health challenges for youth and learn strategies to help youth in both crisis and non-crisis situations. The session will be offered on Tuesday, February 12th from 8:00 a.m. – 4:30 p.m. at the Forest County courthouse board room. Instructors are Sara Foster and Stephanie Feldner of CESA 8. The training is free and open to individuals who live or work in Forest county. Space is limited to 30 participants. Lunch is provided by the Community Coalition of Forest County. Online registration is available here or by contacting UW-Extension educator Michelle Gobert at 715-478-7797. The Community Coalition of Forest County joins organizations across the state to recognize November 30 as Methamphetamine Awareness Day. “Our goal is to encourage people to talk to their children and family members about the risks and dangers of meth use and to get involved by supporting The Community Coalition of Forest County in taking action to prevent meth use,” stated Jacee Anderson, Coalition Chairperson. Review KNOW METH resources and get involved in The Community Coalition of Forest County. Visit knowmethwi.org to learn more. The Community Coalition of Forest County is partnering with the Human Service Center of Forest, Oneida and Vilas Counties to offer Forest County residents numerous opportunities to view a free screening of the documentary “Written Off”. The next Forest County screening date is Wednesday, October 3rd at the Crandon High School. “Written Off” chronicles the life of Matthew Edwards, a Crandon High School graduate, whose addiction to opioids began at age 15, after being prescribed pain medicine for a minor surgery. His grippingly honest writing reveals the secrets he tried so hard to conceal throughout a decade long struggle to escape addiction. Matthew’s mother, Jane Funk, currently a teacher at Crandon High School, published the book “What I Couldn’t Tell you: One Man’s Struggle with Opioid Addiction” in June of 2017 and worked with filmmakers Molly Hermann and Rob Lyall on the “Written Off” documentary. In addition to the film, parents, grandparents and caregivers are encouraged to tour Forest County Health Department’s “Hidden in Plain Sight” mock teen bedroom, which will be set up at the school. The interactive room is a simultaneously amusing and horrifying scavenger hunt, which helps adults spot the signs of substance abuse or addiction that may be hiding in a teen bedroom. This will be set up to view at 5:30 pm and “Written Off” will begin at 6:00 pm. A discussion panel of local law enforcement, Matthew’s mother, Jane, and local recovery coaches will follow the documentary. Admission is free and no registration is required. 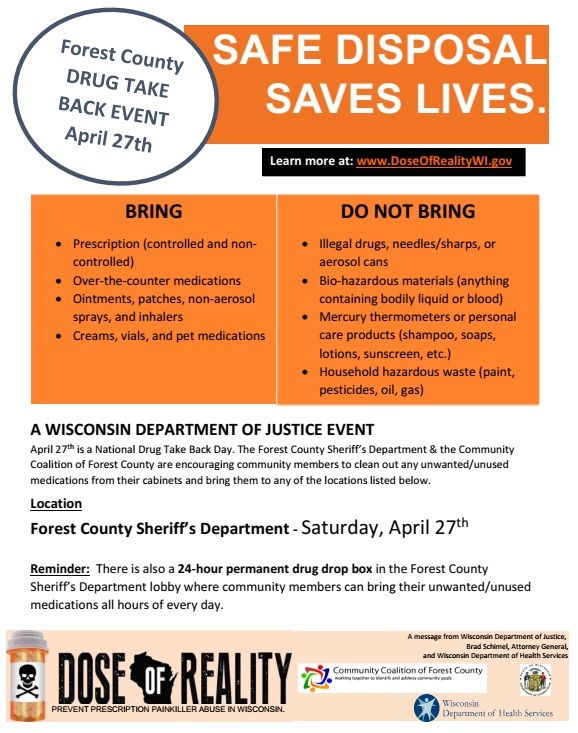 For more information about the documentary film and/or the Mock Teen bedroom, please contact the Forest County Health Department at 715-478-3371. The Community Coalition of Forest County will meet on April 10th at 8:30 a.m. at the Forest County Potawatomi Community building located at 8000 Potawatomi Trail. Items to be discussed include the revitalization of the Drug Endangered Children committee, “Written Off”screening dates, Narcan training update and our Community Asset mapping project. Agendas for the meeting have been distributed to Coalition partners. If your Forest County Service organization is interested in joining the Community Coalition, please contact Michelle Gobert at 715-478-7797.